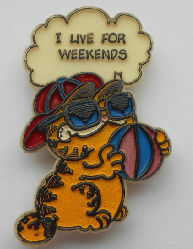 this little Garfield magnet says I Live For Weekends. The magnet is 2 1/4" high x 1 3/8" wide. Design copyright 1978. Previously owned but in good condition.